Each enterprise has its own reasons for moving to virtual infrastructure, but the common benefit is better and more efficient server utilization. Ensure comprehensive visibility with three practical steps. To the novice IT manager, a shift to cloud computing may appear to offer great relief. No longer will their team have to worry as much about large infrastructure deployments, complex server configurations, and troubleshooting complex delivery on internally-hosted applications. But, diving a little deeper reveals that cloud computing also delivers a host of new challenges. For enterprise management, gigabit and 10 Gb Ethernet networks mean high-speed communication, on-demand systems, and improved business functions. For enterprise IT professionals, these networks require diligent maintenance, analysis, monitoring, troubleshooting, and real-time network management. To help fulfill the promise of gigabit technologies, network professionals require a comprehensive, distributed analysis system. White Paper - Increasingly, network operators adopt flow-based technologies such as NerFlow, sFlow, J-Flow, adn IPFIX to gain visibility inbto their networks devices. However, flow-bawed solutions alone are often insufficient to solve specfic end-user problems, and they may even strain networks with the additional data they generate. Flow-level data is great for trending, high-level analysis, and some troubleshooting. However, access to packet data is required for detailed visibility into applications performance, capacity planning, security threats, and end-user experience. Setting up alert triggers by both looking at suspicious traffic and analyzing packets is key. Engineers like me are beginning to see GigaStor™ as an active security tool in addition to its considerable value as an after-the-fact forensic device. Although the Microsoft Lync platform is somewhat of a newcomer to the unified communications world, it has turned a lot of network heads. GigaStor is the perfect solution for security, compliance, and troubleshooting needs. It ends finger-pointing between network and application teams, provides fast and accurate issue identification, and speeds resolution – offering corporate-wide benefits and advantages. 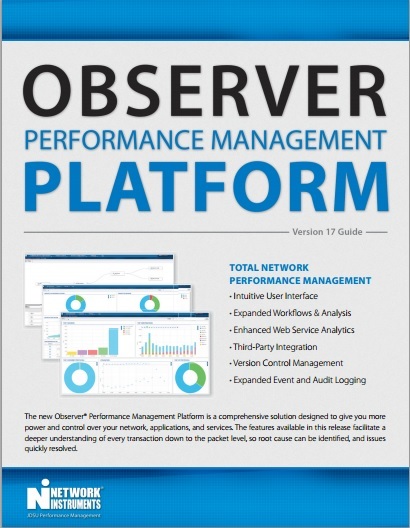 How the Observer® Performance Management Platform can help IT Professionals comply with the data practices components of Sarbanes-Oxley.